It's been a very long time since I have posted here. I've been feeling the urge to blog again but may change the content a bit by maybe adding more travel posts. I got home early from work today and since we are having leftovers for dinner, I did not need to spend the 2 - 3 hours in the kitchen that I normally do. Even for a lot of simple dishes, I spend a significant time in the kitchen--why?! With the extra time, I decided that it was time to start cleaning up my makeup area. I managed to do only 3 medium compartments but practically filled up an 8 gallon trash can! Admittedly, a lot of it was empty product boxes that I kept for years. I normally keep the boxes in case I don't like the makeup so that I can then give it away to someone who will enjoy using it or put it up for blog sale, also something that I have not done in a long, long time.I have at least 8 more compartments or drawers to go through but at least it was a start. Need to make space for more possible products that I may acquire since Nordstrom's Beauty Trend Show is upcoming. I am an admitted makeup brush whore. I love brushes! I have so many all around the house that I don't even know exactly what I have. Brand and price do not matter. I have some very inexpensive brushes that I love--like ELF and BS Mall. I also have a very high end $200.00+ Japanese powder brush. After time, sometimes more quickly than others, brushes that I initially loved, are no longer loved. There's also the wear and tear of time where bristles start falling out. Although I know that I need to go through my brushes thoroughly, it is with heavy heart that I dumped these today. A few months ago, I finally acquired my first bunch of Sigma brushes. I can understand why so many people like them. A quick, sweet and short post for today. Slowly trying to make a blog comeback. While growing up and until maybe 20 years or so ago, I had decently long eyelashes but they were not very thick and full and were typical asian poker straight. The fullness and length that I did have started to diminish with the use of mascara, false eyelashes and age. On May 25th, I started using another brand, which I leave unnamed now Over the past 6 months, I had great results. I've been asked if I started using lash extensions.Even Mai commented that she noticed my eyelashes right away. I stopped using it on November 10 for a couple of reasons. The first being that I believe I was running out of product and I thought perhaps my eyelashes had reached its peak. The second being that I learned about SeneGence LashExtend, which is almost 1/3rd the cost of what I was using. I was all set to purchase it when I decided to become a SeneGence distributor myself so I was able to get one on my own. At this point, I felt that I couldn't expect any more than to maintain my lashes. 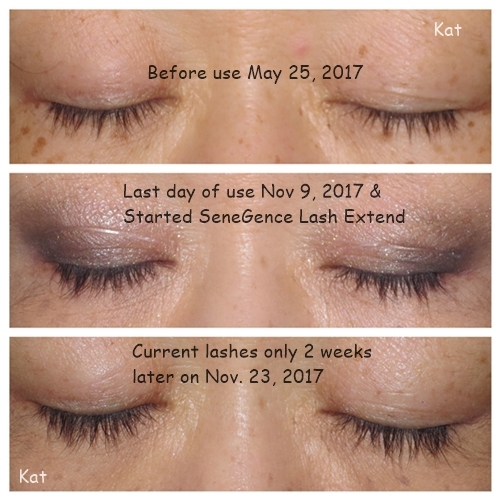 With the product that I had been using prior to LashExtend, my lashes became longer and fuller and amazingly for the first time in my life, it naturally curled! 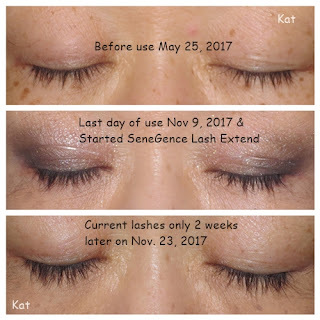 Using SeneGence LashExtend for only 2 weeks, instead of just maintaining, I have noticed even more growth and fullness AND my lashes are still curled. By the way, in the pictures above, those are natural lashes only, no mascara and no eyeliner. I am convinced that if I had used only Lash Extend from May 25th, I would still have the same amazing results. 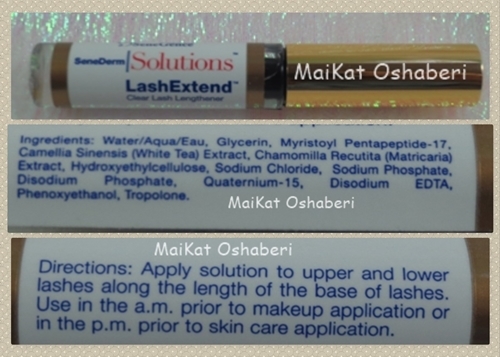 The cost of Lash Extend is only $50.00. As much as I do not like to travel, I do travel at least two times a year. Packing is my nemesis and I try to pack as lightly as possible but don't succeed very well. I have to admit that the bulkiest item that takes the most space is my skin care and makeup, although I have pared it down a lot. Having to pack liquids is always a challenge as I worry a lot about whether or not it will leak so I pack in many layers of ziploc bags. I was really excited when I saw StyleWorks Makeup Brush Cleansing Wipes because even if I am traveling, I like to do a quick daily cleanse of my brushes like I do at home. It was unfortunate to me that the wipes did not perform well. When using the wipes, it did not completely remove makeup from the brushes. After I got home, I used Sephora Daily Brush Cleanser on the same brushes which cleaned them up nicely. This bottle is 2 fl. oz/59.1 ml. 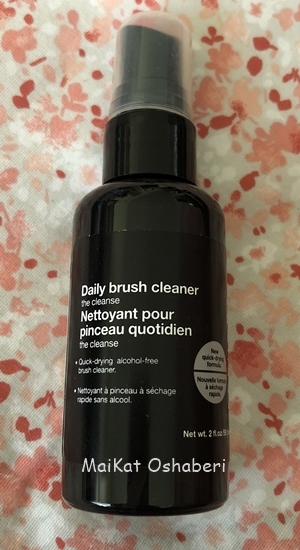 By bringing this with me, at least I know that my brushes will be cleaned properly. Has anyone had success with other brands of makeup brush cleansing wipes? Please let me know if you've had great results compared to the mediocre one that I had. Hi everyone! It's been a crazy, hectic past 6 months. Other than a 2 1/2 week vacation at the end of March/beginning of April, I've been working 60+ hours a week. This week my body is retaliating and I'm not feeling well. Took some time off today and felt the urge to blog. I've been taking lots of pictures but have not had the time or energy to prep them and do a write up. For close to a year now, I've been using coconut oil in my daily skin care regiment. I originally started using it as a binder to press pigments and mineral eyeshadows. I love using it because of its antibacterial and antimicrobial properties. After reading up on different uses for coconut oil, I decided to implement it more into daily use. In addition to using it for pressing pigments, I have been using it as a moisturizer, body lotion, on my hair instead of moroccan or argan oil, both damp and dry hair. I've been wanting to but have yet to use it as a hair conditioning treatment, I've always felt that using oils was too heavy for my skin and hair but the fractionated coconut oil, while being emollient, absorbs well into the skin and is non greasy if used in moderation. A little goes a long way. I find that I need only 3 drops to moisturize my face and neck. 3 drops for my hair too. Any more than that will leave me with greasy, stringy hair. I put the oil into a cobalt glass dropper bottle. (I think the blue color is prettier than the amber color.) This way I can dispense it easily. On my last trip, I took only the fractionated coconut oil with me instead of moisturizers, lotions, eye creams and makeup remover. It worked well and saved some space. It is supposed to help stimulate hair growth and I tried it on my eyelashes without any significant results. Another person used it on a dark spot she developed on her cheek and she said that it really helped to lighten it. I've been using it for months now and I did not notice any lightening of my dark spots. I would love to completely replace using moisturizers with the coconut oil but there are some properties to skin care products that I'm using that I like so I don't think that I can eliminate them. I highly recommend using coconut oil. You can easily look up the benefits and uses to coconut oil. You'll be amazed by all the uses. Do you have experience using coconut oil? If so, please let me know your thoughts and results. Thanks to Mai's planning for something to do to celebrate my birthday (which was last month), we were able to attend this year's Nordstrom Fall Trend Show. She arranged appointments for us to do Kate Somerville's HydraQuench Oxygen treatment, which was a real treat in more ways than one. Kate Somerville is renown for her work with many celebrities. This complimentary treatment is actually a $270.00 value! Mai had actually gotten one done earlier in the week on Sunday, at the start of Beauty Trend Week. She enjoyed it so much that she was able to get it again. The young man who did her treatment was Sheldon and she highly recommends him. She made sure that my treatment was done by him. After cleansing your face, the oxygen therapy is done and then some product is applied to your skin and massaged in. One hint that was given to us by Justine of Kate Somerville counter was to not sweat or get your face wet until the next day. This will allow the treatment to really work into your skin and reap the benefits. Even if you do put makeup on, then remove using makeup wipes and mist or pat on toner before going to sleep, just do not wash until the next morning. Next we went over to MAC to get our makeup done. Mai had actually made all of our arrangements for the day with Pie of Mac. We were fortunate enough to meet her that day and have our faces done by this beautiful and awesome young woman.We kind of let her decide and be creative on what colors to use. She spent at least an hour on each of us and was so much fun. Mai and I commented that we think we've finally found another Beauty Advisor that we really like. We are looking forward to going back to visit and work with her. If you are ever in Hawaii and looking to try something new and exciting, we highly recommend Pie Chun, Beauty Advisor for MAC Cosmetics at Nordstrom Ala Moana. We are looking foward to seeing Pie again and testing out other skin care lines and try out other MAC eye looks. A couple of months ago, someone that I know from a different group had put out a request asking if anyone knew where to purchase the Kanebo Evita Beauty Whip Soap. While researching it, I found that it was probably not released yet. Since I was going to Japan, I offered to pick it up for her since it looked very interesting to me. It is a light, whipped soap which when you press down the two sides, the foam comes up in the shape of a rose. It is also rose scented. I was afraid that it would be strongly scented but fortunately it is very lightly fragranced and is quite pleasant. I was told not press down evenly but lightly. If pressed too hard, too much product would come out and it would be a waste. I was able to find this in a department store. The total price was 1375.92 yen (1274 + 101.92 tax), which I felt was relatively reasonable. I think that this might be an limited edition item because I can't seem to find it online except at gouged prices on ebay. Even Amazon Japan has very limited listings but at a much higher price. I believe that Sheila from Maddy Loves was able to pick this item up last week in Japan but it was by luck that she found it. It is a nice cleansing foam. Very light, lightly scented and doesn't leave my face feeling too squeaky clean and stripped. It is a nice novelty item to have and I do like it enough that I would purchase again if able to. EDIT: I discovered that there is much more information out there than when I looked for it a couple of months ago. This product is designed for women with mature skin although it is very popular with all skin types just because it is so innovative and cute. Main ingredients are royal jelly extract, soluble collagen, two types of hyaluronic acid, sake and rosewater. These are key ingredients providing anti ageing properties and prevents dryness. I still don't know if it's a limited edition item or if it's just super popular that demand is higher than supply. It's difficult to find in Japan.